Twitter Success: Do You Have Twitter SOL? Do you have Twitter Sol? If you do then you are utilizing and leveraging Twitter for all it is worth. You are making friends, networking, and making a difference. If you don’t have Twitter Sol you are not being heard, you have not opened lines of communication, you are not leveraging the network, and you are not making a difference- you are just there. [picapp align=”left” wrap=”true” link=”term=Victor+Mature&iid=4182086″ src=”e/3/9/4/Kiss_Of_Death_63df.jpg?adImageId=12930660&imageId=4182086″ width=”234″ height=”178″ /]Twitter Hashtag events are strategic opportunities to network, communicate, recognize, and launch your brand. If done strategically and properly, your efforts will result in benefits for your brand. But beware. . . there are many mistakes and pitfalls of laziness. We have identified the biggest mistake and the best solution to fix this mistake. [picapp align=”left” wrap=”true” link=”term=high+steel&iid=8394566″ src=”b/9/9/6/Tanker_passing_under_b8d8.jpg?adImageId=12897537&imageId=8394566″ width=”234″ height=”156″ /]The best and easiest method to search for prospects on Twitter, in the past, was to utilize WeFollow.com, Twellow.com or any other Twitter user directory. Although these are fine directories, they have challenges in the way they rank or list people as well as the tags they utilize. There is a better way to find prospects and you can do it in two easy steps. Target users you are competing against, users in your industry, users you network with or wish to network with in the future, as well as significant users you respect that are in your niche within your industry. An even more successful strategy for finding prospects is to check the lists that users (you trust) have created. Ex: Again Chef Ben is a great example with his http://twitter.com/chefben/celebrity-chefs list. This list gave me a head start in building a planned prospect list I wish to follow on a controlled basis. 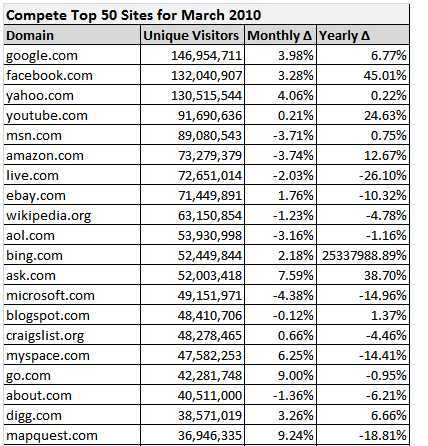 Compete.com’s Top 50 Websites March 2010 provides a glimpse of the changing face of social media influence on web traffic. Most noteworthy is the changes that have happened within the Top 20. Facebook is catching Google for world wide traffic leader, AOL at #10 is still alive, and Microsoft’s Bing is exploding in growth with a massive gain of 25,337,988%! Brian Clark the man behind Copyblogger.com one of the most compelling and successful blogs in the blogosphere is at it again. Brian is giving away a very compelling 28 page report “How to Create Compelling Content That Ranks Well In Search Engines.” This is a comprehensive report that is a fantastic how to first step in writing online content that will get indexed and ranked high in Google.